In the last century, the humanity evolved and discovered a basic knowledge of natural processes as never before. In the 19. and 20. century we formed our basic description of how the world works. Many people of today thought or think, that if we are able to know the constulation of the universe on a certain point in time, we will be able to forecast every process with enough computational power. 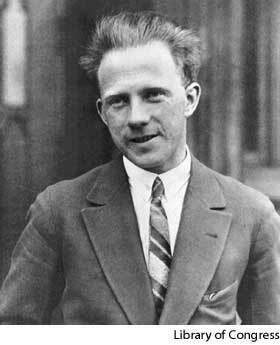 In contrast 1927, a tranquil and smart man called Werner Heisenberg discovered a very mysterious phenomen, namely we aren´t able to detect a velocity precisely on a certain point. The Problem is, that not our measuring equipment is responsible for the indeterminacy, its a phenomen of the nature itself. Thus the natur is evidently indefinite, because every try to make a measurement will affect the object, which will be detected.